It’s officially winter, which means along with staying indoors (except for non-negotiable daily chocolate runs), the best way to keep warm is cooking. Combining our top talents (eating) with our not-so-talented kitchen skills, Lurpak have brought you a beginner’s two-course meal that’s guaranteed to impress. Whether it’s a Christmas in July party or an indulgent two-man treat, here are some tips to foolproof your next mission in the kitchen. Italian cuisine is notorious for chasing away winter blues. Pasta dough can also be prepared a day in advance (pop it in the fridge!) if you’re pressed for time on party day. Serves four, or three extremely hangry foodies. Combine 340g ’00’ flour and 150g semolina flour in a large bowl. Add 3 whole eggs and 3 egg yolks. Combine mixture into a dough and knead on a floured surface for 10 minutes. Wrap the dough in clingfilm and chill whilst you make the ravioli filling (approx 20 minutes). Wilt the spinach leaves in a frying pan with a splash of water. Drain once wilted and add into a food blender, along with the fresh ricotta, grated lemon, grated nutmeg and parmesan. Season with salt and pepper. Whisk to a thick paste and spoon into piping bag. Chill for 20 minutes. Roll out the pasta using a pasta machine. Take a section of dough and flatten before rolling it through the machine on the widest setting. Continue to roll the dough from the widest to the thinnest setting, before folding it back into a thick square and re-rolling from thick to thin at least 8 times. You will notice the consistency of the dough change from rough to smooth. Once rolled sufficiently, place a long sheet of dough on your worktop and brush the entire length with whisked egg. 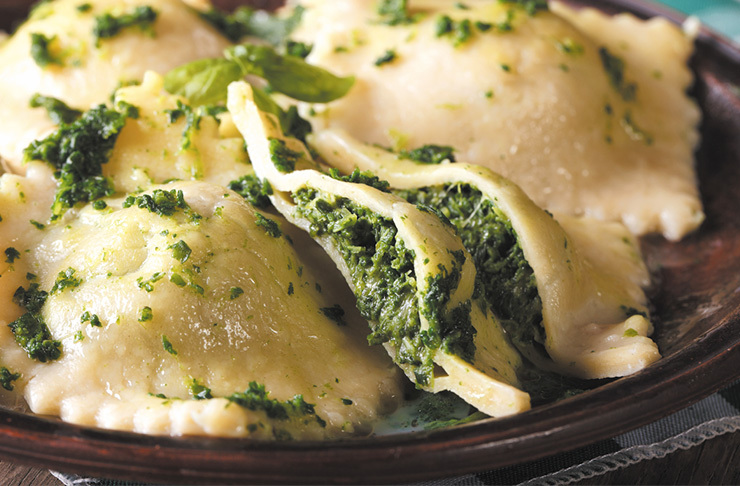 Remove spinach and ricotta filling from the fridge and pipe small circles at regular intervals along the length of the dough until you reach halfway. Now fold the sheet on top of itself and press the dough around each circle of filling. Pressing with the side of your palm so the dough is tightly encasing the spinach and ricotta. Slice your sheet into ravioli squares using a cutter or a knife and place aside while you boil a pan of salted water. Melt 150g Lurpak® over a medium heat. Add 8 sage leaves, the zest of 1 lemon and a pinch of chilli flakes. Boil the ravioli until each parcel rises to the top of the water. Remove with a slotted spoon and add to the sauce. Combine the pasta and sauce and serve with lots of freshly grated parmesan cheese. Our favourite local fresh produce spot, the cheese-loving Prahran Market team have reinvented the ultimate winter warming treat: mac ‘n’ cheese. Stash the cheddar away for a rainy day and head into the aptly named Cheese Shop Deli at Prahran Market for sharp white cheese, gruyere and pecorino romano. Lightly spiced nutmeg, a generous sprinkle of pepper and bacon rashers take this mac ‘n’ cheese to next level, carb-y glory. Serves four, or two people who refuse to eat anything else for an entire day (both valid options, FYI). Heat the oven to 190°C. Butter a 3 litre casserole dish with Lurpak® and set aside. Place bread pieces in a medium bowl. Place a small saucepan over medium heat and melt 30g of Lurpak® in it. Pour the butter into the bowl with the bread, and toss. Warm the milk in a medium saucepan over medium heat. Melt the remaining 85g of Lurpak® in a high-sided saucepan over medium heat. When the butter bubbles, add the flour. Cook, stirring for 1 minute. Slowly pour the hot milk into the flour-butter mixture and whisk. Continue cooking, whisking constantly, until the mixture bubbles and becomes thick. Remove the pan from the heat. Stir in salt, nutmeg, black pepper, cayenne pepper, 2/3 of the cheddar, 2/3 of the Gruyere and 1/3 of the Pecorino Romano. Set cheese sauce aside. Fill a large saucepan with water. Bring to the boil. Add the elbow pasta and cook 2 to 3 fewer minutes than packet’s directions or until the outside of the pasta is cooked but the inside is underdone. Transfer the pasta to a colander, rinse under cold running water and drain well. Stir the cooked pasta into the reserved cheese sauce. Pour the mixture into the prepared casserole dish. Sprinkle the cheeses and bread mixture over the top. Bake until browned on the top - about 30 minutes. While the macaroni and cheese is in the oven, place bacon in a fry pan and cover with just enough water to submerge bacon. Bring to the boil over high heat, then lower to medium. Continue to cook until water is evaporated and bacon is crispy. Chop bacon and set aside. After 30 minutes, take the casserole dish out of the oven and cool for 5 minutes before serving. Sprinkle your macaroni and cheese with chopped bacon. James Street Bakery—is there anything you can’t do?! The baking fairies that bought you coffee and walnut meringues are back with their latest soul-warming creation. 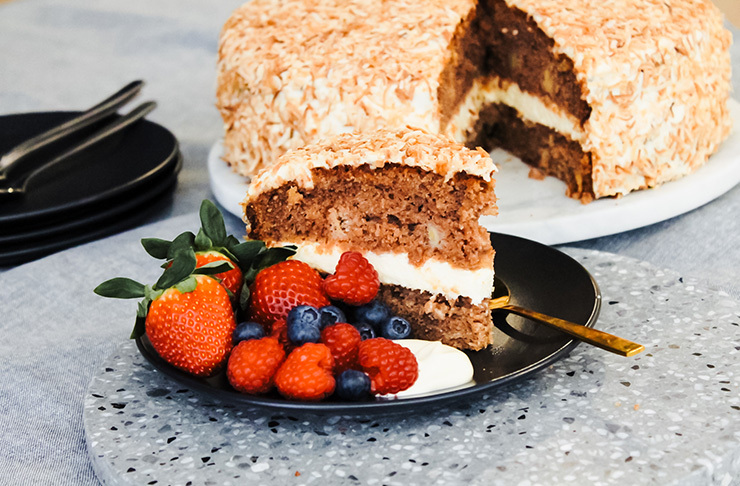 Serve this classic Hummingbird Cake with fresh berries and cream. Serves eight, or two (four times), because who are you kidding? Cream Lurpak® and sugar together, then add eggs and beat until combined. Add everything except the vanilla, pineapple and bananas into the bowl. Mix all ingredients well. Add vanilla, pineapple and bananas into the bowl. Mix lightly. Place in a round tin, and bake for 1 hour and 15 minutes at 170 degrees. Beat all ingredients until combined. Our friends at Lurpak® are giving away some of the best kitchen equipment we've laid our eyes on this year! To enter, simply purchase any Lurpak® product from Woolworths (you'll need it for all that pasta you'll be making...), keep the receipt, and head to this website to enter. Competition runs from Wednesday 28th June, 9am and ends Monday 24th July, 11.49pm. Image credit: Provided | Lurpak, Prahran Market, James Street Bakery (shot by Ben Tyers). Editor's note: This article is proudly sponsored by Lurpak and endorsed by The Urban List. Thank you for supporting the sponsors who make The Urban List possible. Click here for more information on our editorial policy.